When it comes to organ donation, the myths can be off putting…and wrong! 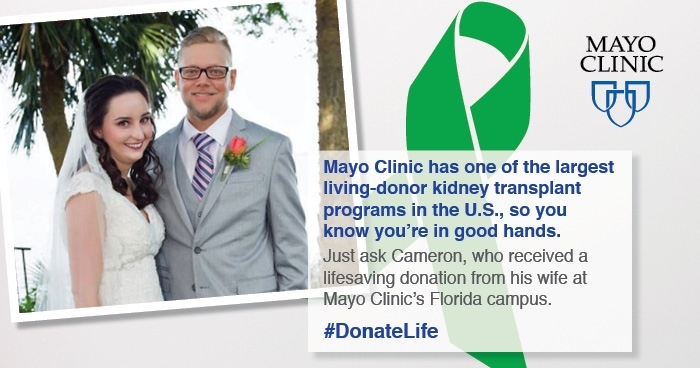 For Cameron Mullis, he knew the fact that there are more than 100,000 people in the U.S. waiting for an organ donation, meant he’d have a long wait to find a donor. Thanks to a kidney donation from his wife, Savannah, Cameron’s wait for a kidney was only four months when it could have been several years. Don't let misinformation keep you from saving lives. Get the facts here to start the process to become a living donor. For Cameron Mullis, he knew the fact that there are more than 100,000 people in the U.S.